Craftsman window trim profiles are based on a classic design that looks good in every home. And not only are these trim profiles beautiful–they’re also simple to build and install! 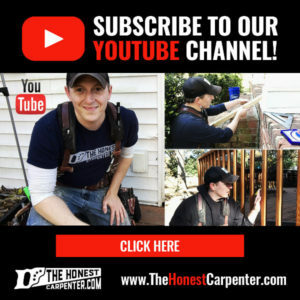 This article and short video from The Honest Carpenter will walk you through a craftsman window trim installation step by step. 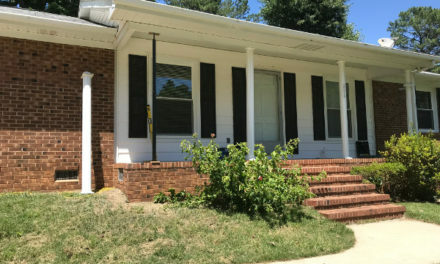 Along the way, you’ll learn about craftsman design concepts, and best methods for saving money on your craftsman window project. 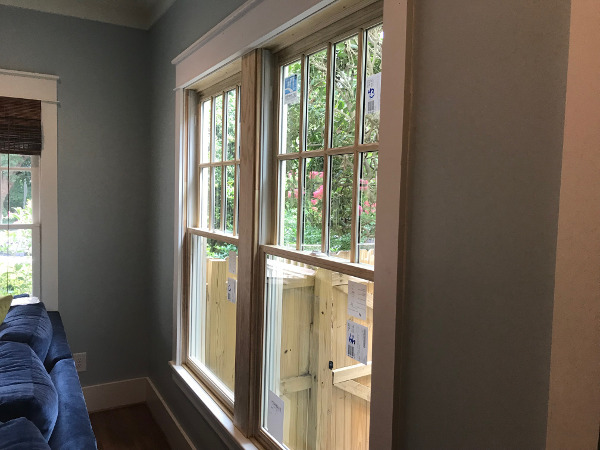 Installing custom craftsman window trim is really no more complicated than making a series of accurate measurements and cuts, and then shooting casings into place with a handful of well-placed fasteners. That said, making nice craftsman window trim profiles is nearly impossible without using power tools. Cuts need to be sharp and clean, and fasteners need to be driven quickly and without heavy force. A decent compressor and brad nailer are essential. You’re also going to need a variety of brad nails to shoot through the varying wood thicknesses in the project. If you don’t feel like buying boxes of every size, brad combo packs can be very helpful. With the right tools at hand, you’re ready to begin! Craftsman window trim is a general trim design profile based on the elements of classical architecture. 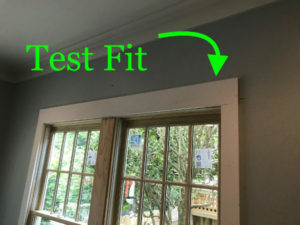 Craftsman window trim can be extremely ornate, or incredibly simple. But, it will always create an identifiable visual effect because it has the same common design elements in every application. 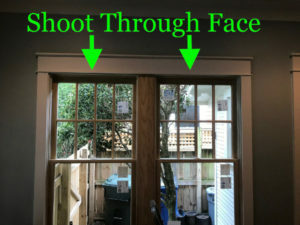 I like to break craftsman window trim into two sections: upper window and lower window. 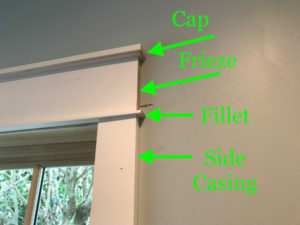 Upper craftsman window trim consists of side casings, fillet strip, frieze board and cap (pictured below). Craftsman window trim upper components. 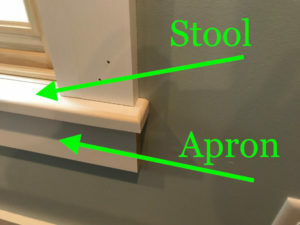 Lower craftsman window trim consists of a stool and an apron (pictured below). Dimensions and details for these various components can vary widely from house to house. Each element can be elaborated upon with subsidiary trim, or enlarged, or even disposed of altogether in some cases. For instance, the stool (which a lot of people erroneously call a “sill”) in my project ran straight across the face of the window jamb. However, in most cases, the stool sits on top of the bottom jamb, and notches around the inner face of the side jamb. 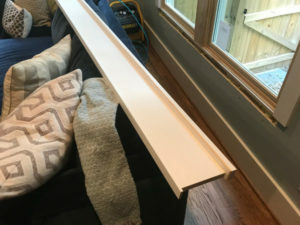 When you’re installing new craftsman window trim in a finished house, though, the point is to always match existing trim profiles as closely as possible. This way, your new window addition won’t look out of place. 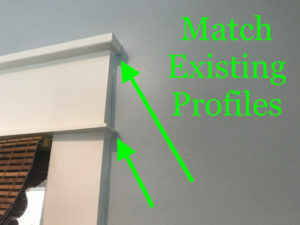 Match existing trim profiles in house or room. 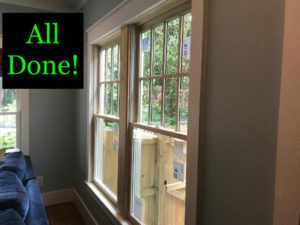 With these considerations in mind, I’ll walk you through my craftsman window trim installation on a newly installed double window assembly. 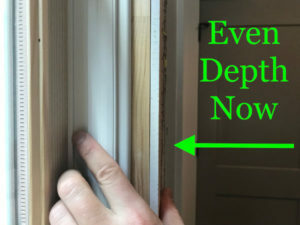 The techniques I use here will serve you well on any craftsman window trim project! Newly installed double window unit. It would make things much easier if newly installed windows always fit like a dream and created no obstructions to window trim installation. However, that’s just not the case. Ever. 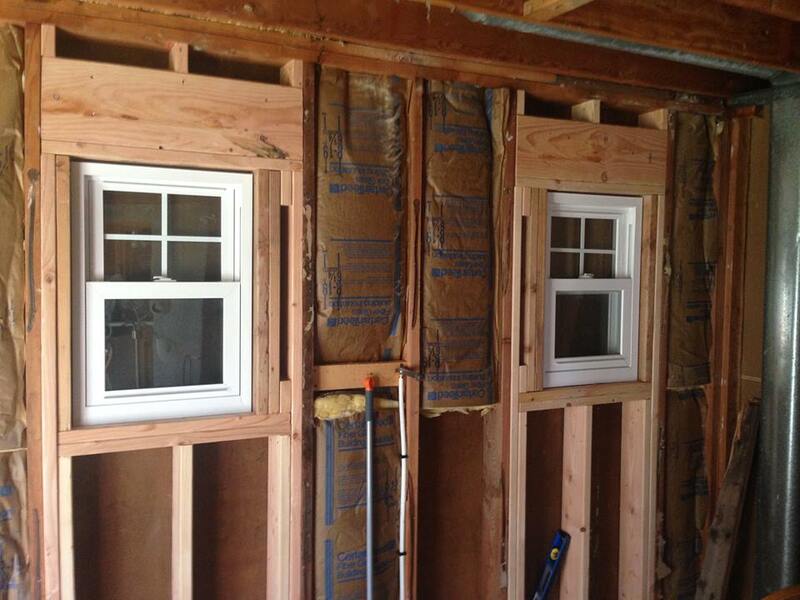 Framers have their hands full just getting windows to fit into their openings, sit level, and remain secure. But, as conscientious as they are, they can rarely get new window units to mate perfectly with a wall. And, they’ll often have to install various caulks and foams to ensure good insulation. To start this project, I had to first cut out the spray foam insulation that extended past the wall face. 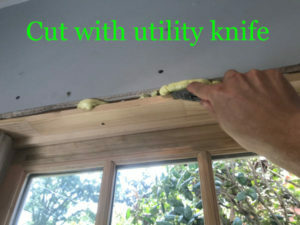 Cut exposed foam with a utility knife and break it off. The foam can easily be cut with a sharp utility knife and broken off. Just cut it back far enough that no bit of it extends past the jamb edge. With the window perimeter cleaned, I then had to address a more difficult issue: unevenness between the drywall face and the jamb edge. 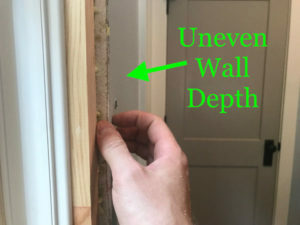 Uneven depth between drywall surface and jamb edge. 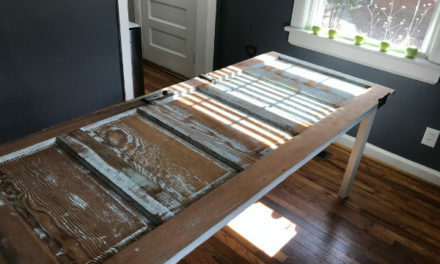 In older houses, this is frequently a problem. 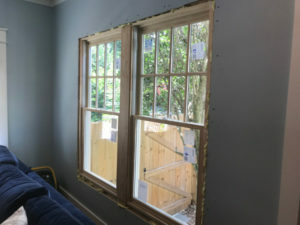 The existing wall is thicker than the jamb width on the new window. 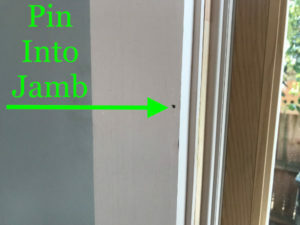 If you were to install trim on the window without first addressing this, you would see a glaring gap between the trim and the jamb! 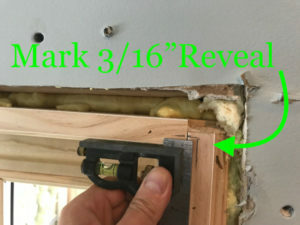 To fix this issue before trim installation, I needed to attach custom furring strips to the jamb face to bring it out flush with the wall. I measured the depth difference around the entire perimeter of the window, and took the average of those measurements: about 1/4″. I then set up my table saw and ripped pine 1×4 to this width. Set up table saw for 1/4″ rip cut. When I had enough for four jambs, I used the miter saw to cut these pieces to lengths that matched the lengths of the jamb perimeter. 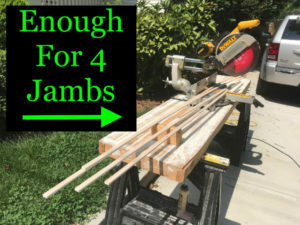 Make enough jamb furring strips for all four jamb edges. I brought the pieces into the house, spread glue on their backs, and shot them onto the edges of the jambs using 3/4″ brad nails. Shoot furring strips onto jamb edge with brad nails. 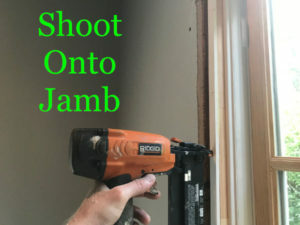 If you have to fur out a jamb like this, just be sure to get the shim edge perfectly flush with the jamb edge. A little sanding, caulk and glue can make the seam between them disappear. 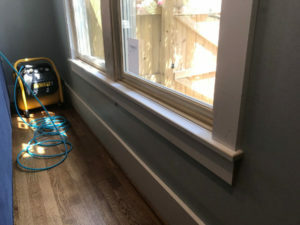 Furring trim has brought edges flush around window. 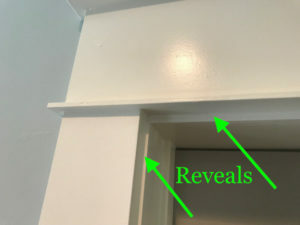 “Reveals” are an architectural detail found on most every door and window. They make the trim clean and aesthetically pleasing. Reveals are created by offsetting the edge of the side casing from the face of the jamb by about 1/8″- 3/16″. This placement creates a step effect between the two trims. Reveals can be found on most every door and window. Before you begin trimming the window, it’s best to go ahead and mark your reveals. This will let you pull measurements to the mark lines, so you can then plot in reveal spacing on each cut. I like to use a combination square to do this. By locking the blade 1/8″-3/16″ from the end, you can easily press the tool into jamb corners and mark the edge with a pencil. Use a combination square to mark 3/16″ reveals. To get my measurements, I gently butted my tape tab down onto the face of the bottom jamb and pulled the tape upward. 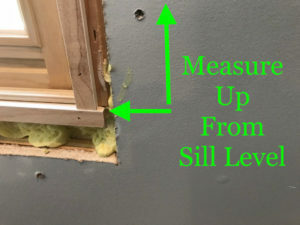 Measure up to reveal marks from sill / stool level. I sighted along the tape at the reveal mark I had just plotted to find my casing length. I measured both sides this way, rather than trust any uniformity in the window assembly. I cut pieces of 1×4 pre-primed pine to these lengths using my miter saw. I cut both pieces out of a single 12′ piece. By making a “split” cut at the center first, I could then pull both measurements from my clean cut ends. 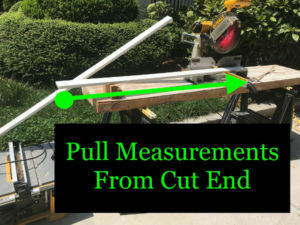 Pull measurements from a freshly cut square end for accuracy. With my pieces cut, I brought them inside and held them in place against the wall. I always take a lot of time lining up the pieces correctly before I shoot them on. I try to see the piece from multiple angles to be sure that it is lined up with the reveal mark, the edge of the jamb, and the stool line below. I first shot the casings into place with a few 2″ brad nails through the outer edge of the casing. These brads should hit framing in the rough opening. 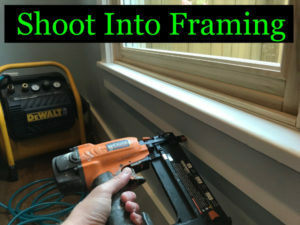 Shoot through the casing into framing using 2″ brad nails. With the casings secured to studs in the wall, the inner side of the casing can then be dealt with. I switched over to 1-1/4″ brad nails to, once again, avoid nails turning out of the jamb face. Lining up almost with the extreme edge of the casing piece, I then shot brad nails into the jamb edge, aiming away from the window sash at a shallow angle. Pin casings to jamb edges using shorter brad nails. You don’t need too many well-placed brad nails to hold a piece in place. Three or four up the jamb side, and three or four more up the framing side is often plenty. No use creating more nail holes than necessary! The placement of the side casings determines the overall measurements for all the rest of the trim in this project. This is because the head casing and the stool casing line up vertically with the side casings. To get the length of the head casing accurate, I pulled a measurement across the outer edges of the side casing. We’ll call this measurement X. Pull head casing measurements from outer edges of side casings. Just to be sure that my measurement was correct, I went ahead and cut the frieze board from 5-1/2″ pre-primed pine. No width rip was necessary to match the existing profile with this piece. 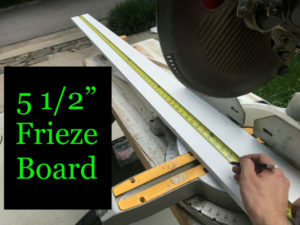 5-/2″ frieze board doesn’t need to be ripped to width. I then brought this piece inside and set it on top of the side casings. Doing this makes it very easy to see that their perimeters line up perfectly. Test fit frieze board before head casing assembly. Confident that the base measurement was accurate, I then went ahead and cut both the fillet strip and the cap to their appropriate measurements. These pieces were a little more involved since they both needed to be ripped to widths that matched the existing profiles. 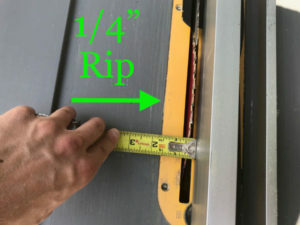 The fillet strip had to be ripped down to 1-1/8″. 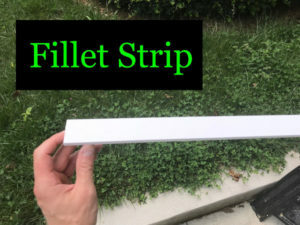 Fillet strip can be found with other trim at lumber yards. The cap piece had to be both ripped and shaped, since the existing profile had a 1/4″ roundover on the underside of the cap. 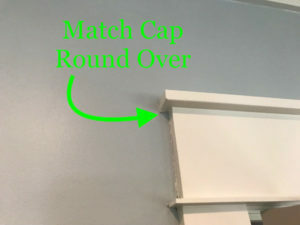 Match cap roundover on existing trim profiles. 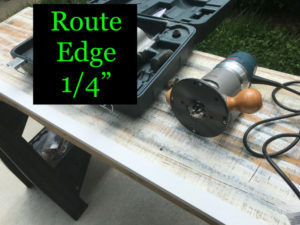 Route cap trim edges with 1/4″ roundover bit. I clamped the piece to my worktable to keep it from moving around. Then, I routed towards the center from one direction, moved the clamp, and continued routing in the same direction to finish it off. I find it’s best to build the head casing away from the wall, then install it as one unit. This keeps the fillet strip from sagging and wobbling, and saves some frustration. To do this, I first spread wood glue onto what would be the bottom edge of the frieze board. Then, I laid the fillet strip down onto that edge, centering it so that it overhung the frieze 1/2″ at both ends (pictured below). 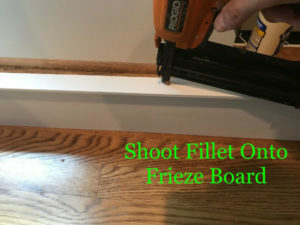 Shoot fillet strip to underside of frieze board. With the fillet attached, I wiped off any excess glue and flipped the assembly. I spread more glue on the top edge of the frieze, and set the cap onto this edge with the roundover pointing down. I attached the cap to the frieze board with 1-1/4″ brad nails. Shoot cap onto head casing assembly. I then moved the head casing assembly into position resting on the tops of the side casings. I made sure that the assembly was correctly centered over the side casing pieces, with everything lining up perfectly. 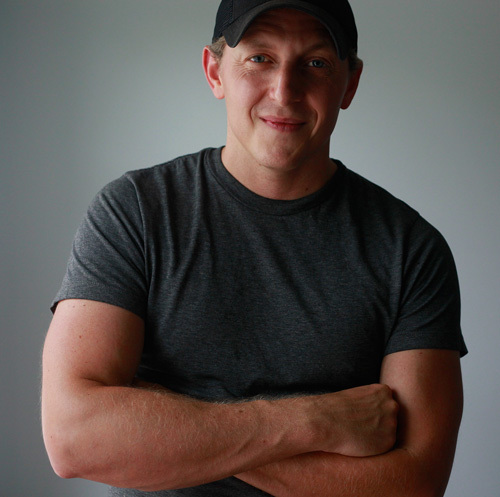 Then, I shot the assembly to the wall with 2″ brads. Headers above window openings provide pretty much unlimited attachment opportunities for trim in this area. You just have to be sure you’re not hitting the air gap below the header, but above the top jamb. 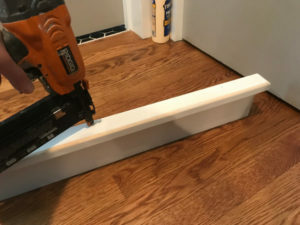 Shoot through the trim face in the upper half of the frieze board to be sure you’re hitting lumber. 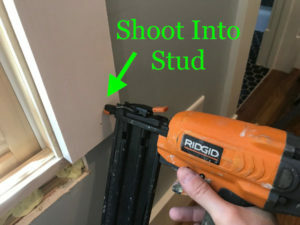 Shoot head casing to wall through face using 2″ brad nails. Stool and apron on wall. The lower window assembly–consisting of the stool and apron–is built and installed in a very similar way for this project. 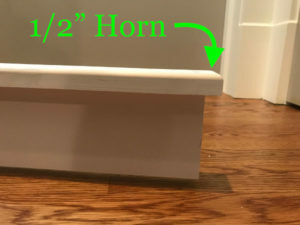 Stool “horn” extends 1/2″ beyond apron and side casings. 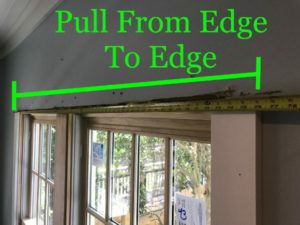 Rather than rely on the bottom of the window being the exact same size as the top of the window, I once again pulled a measurement from edge to edge at the bottom of the side casings. It was, indeed, about 1/16″ bigger. 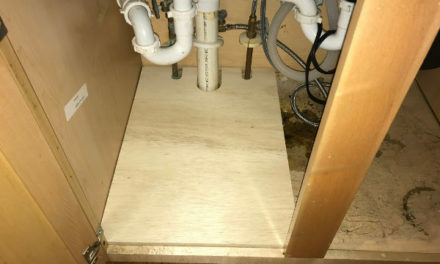 I once again brought the pieces inside and built the lower assembly by spreading glue on the top edge of the apron, then shooting the stool onto it with 1-1/2″ brad nails. 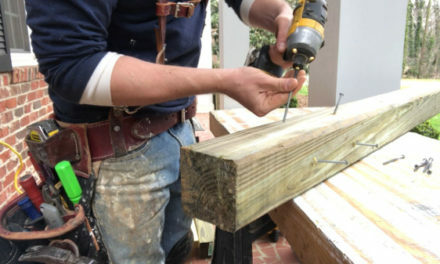 Shoot stool onto apron using 1-1/2″ brad nails. When the unit was complete, I held it in place, pressing it up to the bottom ends of the side casings. I shot the unit onto the wall using 2″ brads. Framing was less available here than it was in the header, so I made little ticks on the wall where framing members (“cripples”) existed. 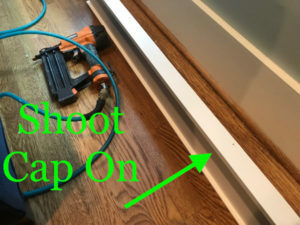 Shoot lower assembly onto wall using 2″ brad nails. With that, the carpentry portion of my craftsman window trim project was all done! Other than caulking and painting, this job was all finished up in just over 2 hours. I think craftsman window trim is a great introductory project for anyone looking to tackle more complex trim styles. The clean, square elements make measuring and cutting straightforward, but the finished product has a stately look nonetheless. You’re all set to tackle your own craftsman window projects! Craftsman window trim job all wrapped up. NextCONTRACTOR, CARPENTER, WOODWORKER: WHAT’S THE DIFFERENCE?